Leaders cannot ignore the informal, yet powerful, impact that networks have on their success. Savvy leaders continuously seek resources, perspectives, and insights from individuals with diverse affiliations, backgrounds, and incentives. By adding the ABCs of strategic connections– Advocates, Ambassadors, Brokers, Champions, and Connecters– to your network, you will be better prepared for future challenges and priorities. If you think towards the future when building your network, then you will be more prepared for future challenges and priorities. Your supportive network is important in your daily work. However, if more than 65% of your network is supportive, your network is probably too tactical. It is important to invest time in “strategic” networking. Start by brainstorming with these questions: Who do I already know that can introduce me to other contacts? Are there similar organizations outside of my geographical area? Which industries or professions share the same interests as me? What services do my client demographics use? Are there educator or academic connections that can be mutually beneficial? Who in particular can help me with my strategic goals? Create opportunities for connecting with those people you have identified. If you can’t find any common ground, do some research about the person. Join social or professional activities they participate in. Get involved in person and on-line. LinkedIn is a great platform for making new connections. Ask yourself and others within your circles of influence, “Who do I know that might be able to connect me with that person?” If you cannot find a common connection, read our next post for a step-by-step guide on how to approach your connections and what to say when you meet them. 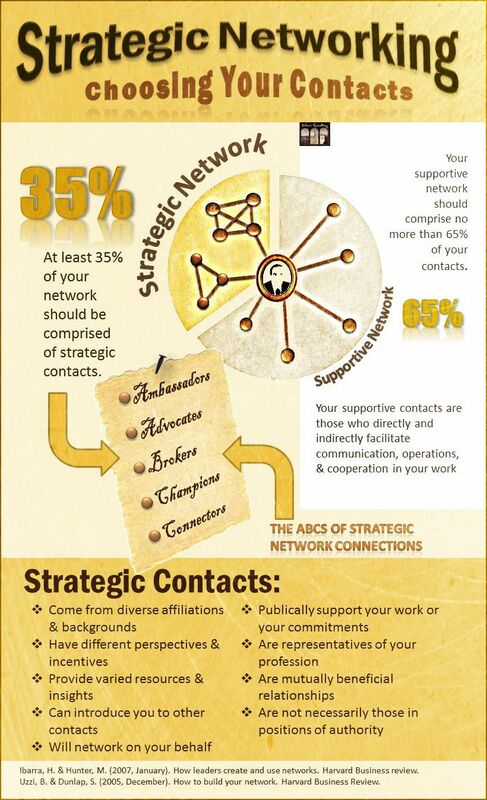 What percentage of your network is strategic? When selecting strategic contacts, what would happen if you chose them based on your desired future? What can you do differently to grow your network? This entry was posted in Leadership and tagged leadership, networking, strategic networks. Bookmark the permalink.